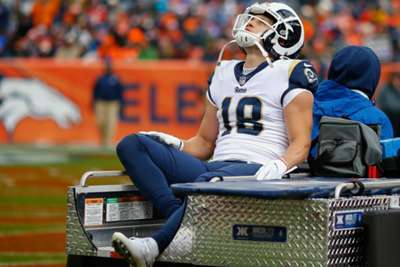 Los Angeles Rams wide receiver Cooper Kupp has been ruled out for Sunday's game against the San Francisco 49ers, coach Sean McVay said on Wednesday. The 25-year-old sprained his MCL running a jet sweep in the Rams' win over the Denver Broncos. After being carted off the field, Kupp later returned to the game. It was expected he would miss some time, possibly beyond week seven. "Do not expect him to play," McVay told a news conference. "We're going to take it a day at a time with him, but it's safe to rule him out for this week. "We'll just see how he progresses one day at a time, but if there's anybody that's going to attack his rehab the right way we all know that's going to be Cooper." Kupp has caught 30 passes for 438 yards with five touchdowns in six games as one of quarterback Jared Goff's top targets. His absence will open the door for second-year player Josh Reynolds in the Rams' three-receiver sets with Brandin Cooks and Robert Woods. The Rams are getting one weapon back on Sunday. Kicker Greg Zuerlein, who strained his groin before the week two game against the Arizona Cardinals, has been cleared to play. Zuerlein led the league in scoring last season with 158 points.